NEW YORK – August 16, 2012 – Season six of DEXTER concluded last fall with one of the series' most shocking moments – Dexter got caught by none other than his sister Deb. As season seven kicks off on Sunday, September 30th at 9 p.m. ET/PT, DEXTER's devoted fan base wonders – what will he do, and what will she do? The wait is almost over as SHOWTIME unveils a sneak preview of the exciting upcoming season on its website. 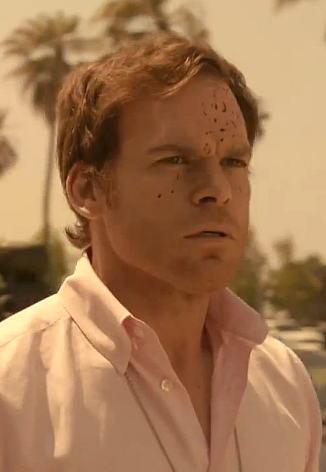 DEXTER stars Michael C. Hall in his Golden Globe® Award-winning role as Dexter Morgan, a complicated and conflicted blood-spatter expert for the Miami police department who moonlights as a serial killer. The series also stars Jennifer Carpenter, Desmond Harrington, C.S. Lee, Lauren Vélez, David Zayas and James Remar. Season seven guest stars include Jason Gedrick, Katia Winter and Santiago Cabrera, and special guest stars Ray Stevenson and Yvonne Strahovski. The show has received multiple Emmyand Golden Globenominations for best television drama series, as well as a prestigious Peabody Award in 2008, and was twice named one of AFI’s Top Ten television series. Dexter is the No. 1 rated series on Showtime, watched by nearly 5.5 million weekly viewers across platforms. Season six was the series' highest rated season ever. Season seven returns in dramatic fashion, as Dexter (Hall) is finally forced to confront his greatest fear, as Debra (Carpenter) witnesses his insatiable, ritualistic slaying of a killer. Now Deb knows the secret of his Dark Passenger, as she tries to reconcile the unfathomable idea that her beloved, mild-mannered brother is Miami’s most notorious serial killer. Dexter is still pulled by his natural impulses to seek out the guilty and exact his brand of vigilante justice, leading him on the trail of a brutal Ukrainian mobster (Stevenson). Along the way, Dexter meets Hannah McKay (Strahovski), a strong, independent woman with a past that she's struggled to put behind her. Produced by SHOWTIME, DEXTER is executive produced by John Goldwyn, Sara Colleton, Scott Buck, Manny Coto, Tim Schlattmann, Wendy West and Michael C. Hall. Dexterdaily's shotgun method of posting anything Dexter related never ceases to waste my time by having me read the same thing over and over :) More fresh meat, please? The non-regurgitated kind. I was JUST going to say, meh, this is NOTHING NEW and you both beat me to it! Looks like someone gets ran over in the trailer. There are bloody drag marks on the road.